Cheap hotels in Venice, Italy : a review of the Hotel Marco Polo. Good quality, cheap hotels in Venice are hard to find. We review one of the best - ideal if you're travelling on a budget. How 'cheap' are cheap hotels in Venice? Let's be straight about this - there is no such thing as a cheap hotel in Venice itself. They're all expensive. If you want to know just how expensive they can be take a look at our review of the Hotel Danieli as an example. If you're travelling to Venice on a budget, you'll find the less expensive hotels are to be found on the mainland which is linked by a causeway to Venice itself. But even then, many are of questionable quality - and horrific travellers' tales of bed bugs and filthy bathrooms are common. The reality is that everyone wants to go to Venice, and hoteliers often think they can either charge the earth, or charge less for a very low quality of service. So finding good quality but reasonably cheap hotels isn't easy. The Hotel Marco Polo is a wonderful exception. It's a little gem. It's in an area called 'Mestre' which is not too far from the city and the sights. It has good links with the airports and with Venice and the islands, is clean, very friendly, and very reasonably priced. So if you've had trouble before trying to find an inexpensive hotel here, or if it's your first time and you want accommodation that comes highly recommended, you're in luck. Take a look at the hotel's short video. It's a while since we stayed at the Marco Polo, and the hotel has undergone a complete refurbishment since then. Take a look at this short video which will give you a much better idea than my tiny photos! If, having seen this, you want to book, use this link. If you want to know more, read on! First things first - where is it? "The location is perfect for the airport, and visiting Venice for a weekend break or a longer stay." The Marco Polo is in the Mestre district, on the main A4 road into Venice. It's only three kilometres from Venice's Marco Polo international airport, twenty from Treviso airport (into which most of the budget European airlines fly) and ten kilometres into Venice itself. It's easily recognisable - it's the only pink building in the area! Its location is a quiet, residential neighbourhood. You'll have no problems in terms of feeling safe - it's like living in a small town and everyone around is friendly and helpful. This hotel is in a great position for anyone visiting Venice either for a long stay or for a short trip. What is the Hotel Marco Polo like? "The hotel is new and comfortable .. it's the best value for money." 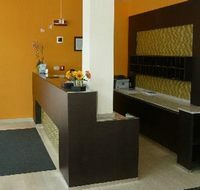 This is a comfortable, modern, three star hotel, completely renovated in 2008. It's not a big hotel - it has twenty-two rooms, all of them en-suite. "Free wireless internet, free parking and free buffet breakfast - yes, rather amazing on all three points." 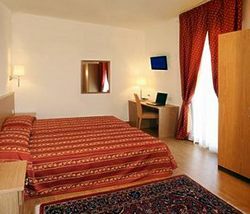 The Hotel Marco Polo has many facilities which you'll find lacking in some five star hotels. The front desk is open twenty-four hours and offers an express check in and out; the reception staff are particularly highly commended by visitors (see below). There's a cosy public bar, a spacious breakfast room, a roof terrace, disabled access, luggage storage if you need it between check-out and your flight, an elevator, non-smoking rooms, and air conditioning or heating throughout the hotel depending on the season. Importantly - and very unusually for Venice - there's free car parking in the hotel's private car park. "Les chambres sont grandes, climatisées et propres." All rooms are heated or air-conditioned, en-suite with shower, toilet, bidet and washbasin, and hair-dryer. Beds are double, an extra bed can be provided if required, there's a television (Italian channels only but who wants to watch TV when you're this close to Venice? ), wireless internet access, an electronic safe, and all rooms are sound-proofed. Most importantly, reviews all comment on the cleanliness of this hotel. "It's a great hotel with a professional staff who took the time to personalize our experience." Talk to anyone who's stayed at the Hotel Marco Polo and they will almost without exception talk about the lovely staff group. The staff speak good English and reports from French and Spanish people suggest their other languages are equally as good. "Reception made this three star hotel a five star arrival moment. Personal care, respect and attention were better than most five star hotels - and I can comfortably say this as I worked in the five star industry for fifteen years." If you've ever stayed in Italy on a budget you'll know that most cheap hotels in Italy have very poor breakfasts. The same cannot be said of the Hotel Marco Polo. 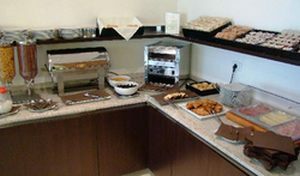 The breakfast room is light and spacious, and the buffet breakfast which is included in the room rate is excellent for this price of hotel. There's a good selection of foods which will set you up for the day ahead, and the coffee is excellent. Although breakfast doesn't start until 7 a.m., if you have an early flight ask at reception whether an early breakfast can be provided. We've known this done by the extremely helpful and accommodating staff. The hotel doesn't have a restaurant on site and so doesn't provide other meals. There are some good restaurants in the local neighbourhood, but they do tend to close quite early so if you know you have a late flight in, make sure you eat somewhere else first. The main street has its share of local shops including clothing, a greengrocer, post office and restaurants. Diagonally opposite the hotel is a bank with a cash till ('Bancomat') so you can withdraw cash twenty-four hours a day. Have a look at this page about currency in Italy for information about withdrawing cash using a debit or credit card. "I loved that this hotel was on the mainland about ten minutes by city bus from Venice." Getting into Venice from the Hotel Marco Polo is easy, cheap and quick. The frequent number 5 bus stops opposite the hotel just a few minutes' walk away and will take you into the very centre of Venice (Piazza di Roma) in less than fifteen minutes for around €2.20 return. Tickets can be bought at the hotel reception and the buses run all day until about 11.30 p.m. This is when you'll be really glad you're staying outside Venice rather than dragging your luggage down tiny alleyways and across bridges to a hotel in Venice itself. Venice's main airport is a mere ten minutes away, also by number 5 bus which stops right outside the luggage hall. If you take the bus from your inbound flight, ask the driver for the bus stop at 'Campalto' which is the closest to the hotel. If you prefer a bit more luxury, a taxi will cost about €14, or the hotel can arrange a private transport if you ask at reception. They can also arrange a car to meet your inbound flight if you ask them when booking. You're looking for a luxury hotel like the Hotel Danieli or a hotel right in the centre of Venice itself. You're seeing Italy on a budget and want a basic but good, clean, comfortable hotel staffed by pleasant, helpful people and within easy reach of Venice. We use Booking.com for all our hotels now, having tried other companies and found them the best for reliability, price and customer service. To book the Marco Polo through Booking.com, follow this link. Disclosure - this is an affiliate link. The Marco Polo is situated on a very busy road. Despite the good sound-proofing and double glazing there can be some road noise which may disturb you. If you're a light sleeper, ask for a room at the back of the hotel when you book.